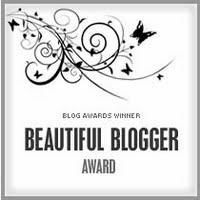 Today I was awarded this Beautiful Blogger Award by Sharon at MyFrenchCountryHome. Thank you very much, Sharon, I'm pleased you like my blog. Apparently I have to reveal 7 things about myself. I will not be adding photos like Sharon did so beautifully though. 1. I studied Arabic & Islamic Studies at university (Exeter). Why? Because I liked Persian rugs and it meant a year in Cairo (yes, I know they speak Persian in Iran, but it's a closed country so I decided Arabic would have to do). 2. I couldn't live without my Sky Digibox and the English tele it delivers to my sitting room. Not that I watch tons of tele, but just having French tv is a nightmare. 3. I'm quite fanatical about food and eating. Eating is a joy, a sensual experience, and meals should be tasty and fresh. 4. If there's a talent I wish I had it's being able to paint. I'd love to be able to render beauty to canvas. I wish I could draw too. 6. Since my divorce, I've become more spartan in the way I live. I cannot abide clutter and having stuff. The less you have the freer you are. I prefer to eat better. 7. These are absolutely the best and happiest years of my life (stuff school, I couldn't wait to leave). Now I'm supposed to tell you about blogs I read, but I did that recently here and as I'm a bit slow about discovering new blogs, I haven't anything new to add. Never mind, eh? These rules that go with tags are there to be ignored I feel. Just take them and say thanks, l reckon. We have UK telly and French telly and I know I should persevere harder with the French programmes but i do find them a bit dull. MInd you I find English tv dreadful and dull so it's a lose/lose situation. Well done on the award btw. Thank you, FF. I'm having a bit of a murder mystery phase at the moment, and like to watch Rosemary & Thyme, Poirot, Miss Marple etc whenever I can. Some of the travel progs are good too, like the one around the latitude line of the Tropic of Cancer. I like BBC 4 and ITV3 best I think. Less stuff. We all need less stuff its amazing just how little you need if you think about it. Looks like you have a very good approach to things if I may say so. Thank you, Johnny. I think anyone who's been through divorce and the splitting of stuff, plus what that stuff represents is at least a bit traumatised by the whole 'stuff' thing. What would I save from a burning house? My small computer and my handbag. I would regret the loss of my books though. Congratulations. Your blog has always been very interesting since I have been reading it. Thanks Nick, I'm glad you enjoy reading it.